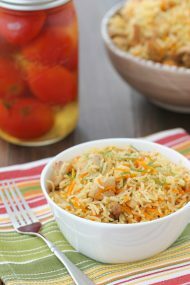 Rice is one of my favorite side dishes and I love serving it with many of the main courses that I cook up. It’s so quick, healthy and we love the taste too. I usually make some type of rice pilaf, keeping it plain or adding some garlic and parsley, or carrots and onions, etc. I have a really easy, foolproof recipe for perfect rice, and that is my go-to method. 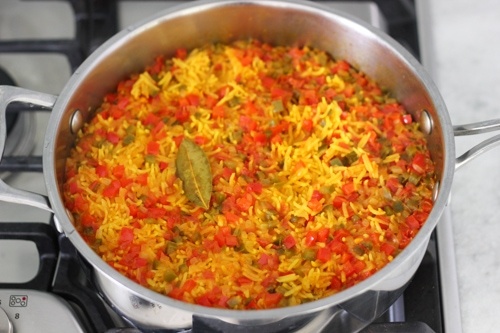 Since we live in Florida, we are also familiar with yellow rice, which is common in Spanish, Mexican, Latin American, etc. cooking. It’s served as a side dish in many local restaurants. Let me tell you, it has earned a praiseworthy reputation for a very good reason. I used my basic rice recipe as the foundation of this dish and then added all the ingredients that I have loved whenever I tried this dish. This is by no means an authentic recipe, but my version of it. 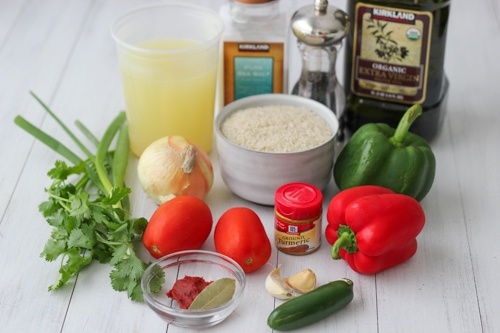 I love the flavors that are added to the rice by using 3 different types of peppers, tomatoes, onions, garlic, spices and herbs. Using chicken broth instead of water really adds another dimension of flavor to the rice as well. It’s very easy to make, looks stunning and reheats beautifully. 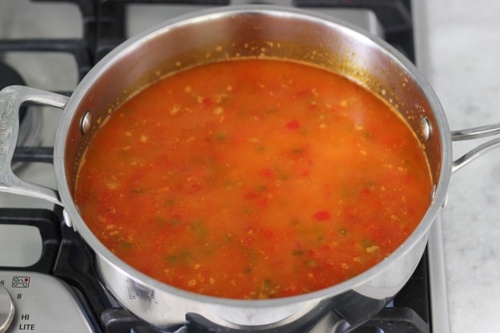 While you are sautéing all the vegetables, bring the chicken broth to a boil in a small saucepan and keep it hot and ready to be added to the rice. 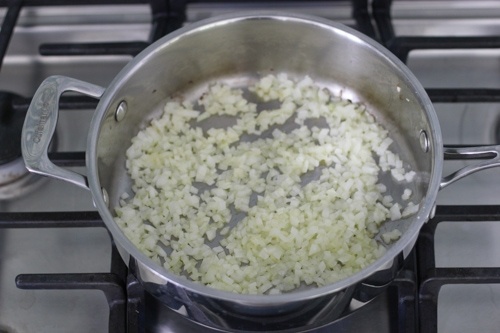 In a large skillet or a medium pot, heat the olive oil on medium high heat. Add the onion, season with salt and pepper and cook for 3-5 minutes, until it is tender and translucent. 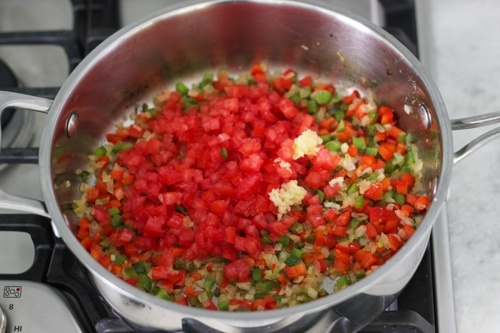 Add the chopped peppers, season with salt and pepper and cook for another 2-3 minutes. For the jalapeño, I like to charr it in the oven first, peel off the skin, remove the seeds and then finely chop it. You can simply chop up the jalapeño without charring it first. 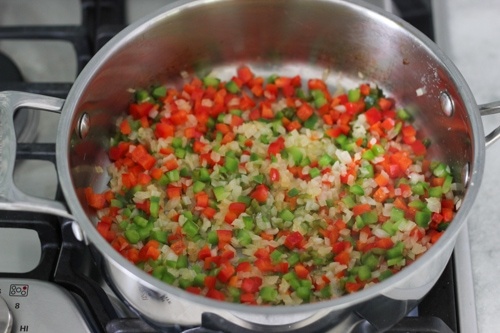 Also, you can use as much or as little of the green and red peppers as you like. I usually use one small bell pepper and only 1/4-1/2 of a green pepper. Add the chopped tomatoes and garlic to the skillet and cook for 2-3 more minutes. Add the tomato paste and the turmeric. 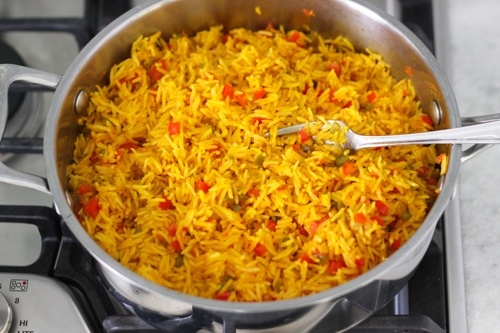 The turmeric is what will give the rice it’s gorgeous yellow color, so don’t omit it, or you will not have yellow rice, you will have regular rice pilaf with vegetables. Mix to combine and cook for about a minute. Add the rice to the skillet, increase the heat to high and cook the rice for about 2 minutes, making sure to mix the the whole time and get it coated and throughly mixed with all the other ingredients in the skillet. Add the dry bay leaf to the skillet. Pour in the boiling chicken broth, the rice should come to a boil right away. Decrease the heat to low, and cook, covered, for 15 minutes. 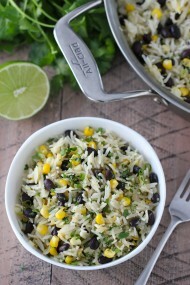 Fluff the rice with a fork, discard the bay leaf and garnish the rice with fresh herbs. 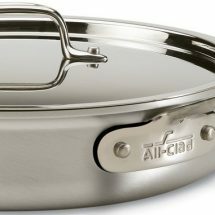 In a large skillet or a medium pot, heat the olive oil on medium high heat. Add the onion, season with salt and pepper and cook for 3-5 minutes, until it is tender and translucent. 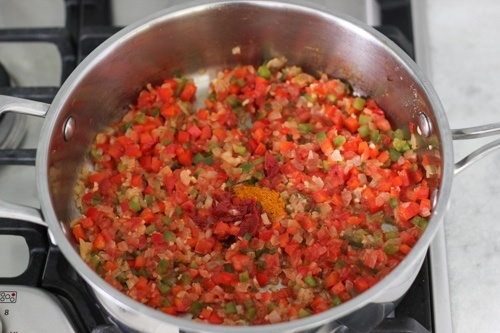 Add the chopped peppers, season with salt and pepper and cook for another 2-3 minutes. For the jalapeño, I like to charr it in the oven first, peel off the skin, remove the seeds and then finely chop it. 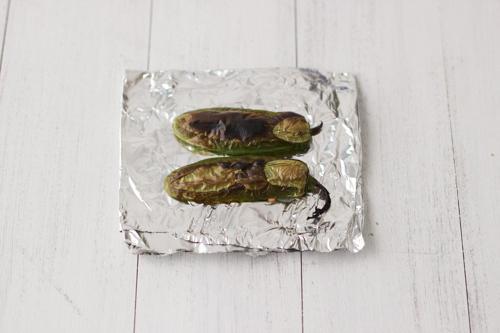 You can simply chop up the jalapeño without charring it first. 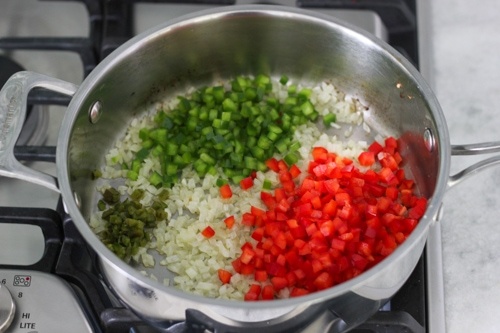 Also, you can use as much or as little of the green and red peppers as you like. I usually use one small bell pepper and only ¼-1/2 of a green pepper. Add the chopped tomatoes and garlic to the skillet and cook for 2-3 more minutes. Add the tomato paste and the turmeric. The turmeric is what will give the rice it's gorgeous yellow color, so don't omit it, or you will not have yellow rice, you will have regular rice pilaf with vegetables. Mix to combine and cook for about a minute. Add the rice to the skillet, increase the heat to high and cook the rice for about 2 minutes, making sure to mix the the whole time and get it coated and throughly mixed with all the other ingredients in the skillet. Add the dry bay leaf to the skillet. Pour in the boiling chicken broth, the rice should come to a boil right away. Decrease the heat to low, and cook, covered, for 15 minutes. 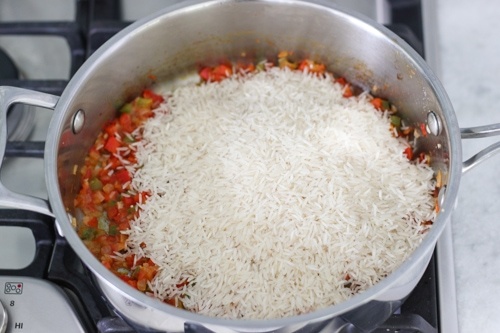 Fluff the rice with a fork, discard the bay leaf and garnish the rice with fresh herbs. Mmm that looks mad good! 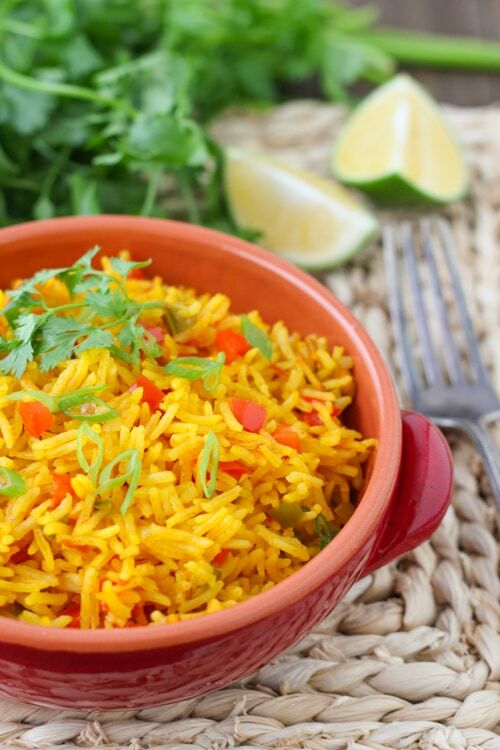 I love yellow rice, this homemade version sounds fantastic! 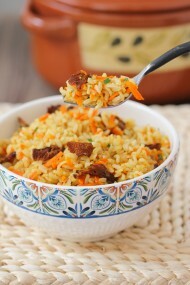 Olya, I love rice too, this looks really good! Want to make this one for dinner tonight along with some chicken. Yum and can’t wait. For once I have all the fixings to make it. Hey Olga….thanks for the recipe. I m pregnant n was dying to have yellow rice after seeing ur Instagram pic… I have some complications n on bed rest …..I will ask my mom to cook the same for me…thanks for d post. Sorry about that. My website was acting up when I was posting this recipe and gave me a really hard time. I’ll get it fixed. That’s great, Anya. I’m so glad you enjoyed it. Just put in in the oven under the broiler until it’s charred, Mariya. It’s hard to tell you the timing, since it really depends on your oven and the size of the pepper. Yum. I made this yesterday for dinner to go with my favorite Mexican dish and it turned out amazing. 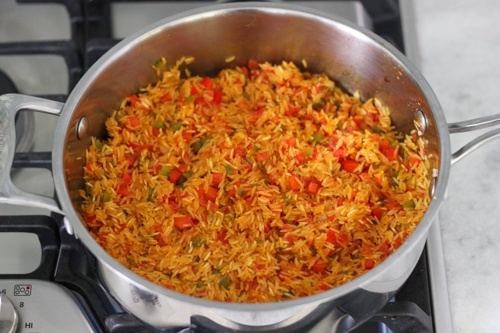 I’ve tried about 10 different Mexican style rice dishes at home and this one is by far my favorite. Wow, that’s awesome, Valentina! I’ve looked for the perfect recipe for this recipe for a while too:). I’m so glad you liked my recipe. Thanks for taking the time to write. Thanks for the wonderful recipe! I have only had it pre-bagged. This is so much better. You’re welcome, Kel:). Thanks for taking the time to write. This rice is under freezer friendly tab and wanted to see can it be frozen? Yes! Rice freezes really well, Tabitha.